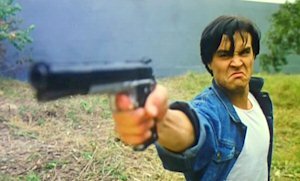 The Skinny: The first Brandon Lee action extravaganza is an average HK action flick. Those seeking Hard Boiled will be disappointed, but this movie is still better than Navy Seals. by Kozo: The first starring vehicle of Brandon Lee is a decent actioner, though it suffers from poor plotting and an ultimate blandness. The younger Lee is betrayed by "best friend" Michael Wong, who's a nasty triad guy who has a thing for Lee's fiance (Regina Kent). Wong frames Lee for the murder of a cop, which sends Lee up the river for a good while. When he gets out, he vows revenge, but things are more complicated than you'd expect. In his absence, Wong has risen higher up the triad ladder, and has his claws deep into Lee's old girlfriend. Then Brandon gets out and it's revenge time.